When Sarah and Martin from Essex landed at Malaga airport to plan their wedding in Spain they never dreamt they could organize their party in a week-end. 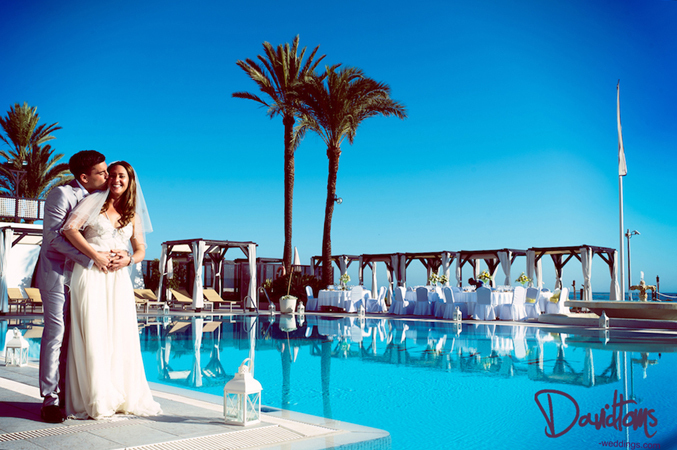 Scott met the bridal couple and took them on the complimentary Sunshine Weddings Spain venue tour along the coast and it didn’t take long for them to find their dream wedding venue in Spain. The moment they walked into the beach club in Marbella they instantly fell in love with the sea views and space where they imagined their wedding party to take place. They flew back to Essex feeling relaxed and in the safe hands of our wedding planners in Spain knowing they would soon be getting married at their dream wedding venue in Marbella. September came around very quickly and the Sunshine Weddings Spain team worked extremely hard to make sure all the preparations were in place and ready for their close friends and family from Essex to descend on Sarah and Martin’s special wedding in Spain. Sarah’s colour scheme reflected their fun wedding theme, set by the sea and in the sun, with yellow as her main colour flowing through in her floral arrangements, chair décor & scrummy cakes, accompanied by a fabulous turquoise colour for her bridesmaids. Fun in the sun was definitely the theme so entertainment was a huge focus of the day with a violinist and keyboard for the ceremony, saxophonist playing jazz at the reception and with the evenings music running long into the night and played by a brilliant trio singing 80’s club classics & commercial music. To complete the memories for this beautiful wedding in Marbella. David Toms worked his magic with the couple and all the wedding party to produce the most stunning, fun, entertaining and romantic photographs bringing every detail of their wedding day to life!